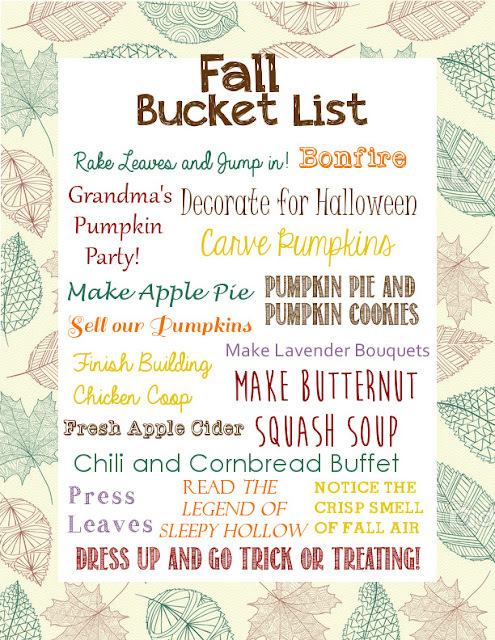 The kids and I our Fall bucket list the other day! I should have put a great bit "RELAX!" on there. I already feel things winding down--a lot of the things that I felt like I needed to take care of immediately after moving in have been taken care of. Every week more things get scratched off that forever long list, and I am really feeling like I can relax more lately. It is a wonderful feeling! I'm hoping sometime this fall I can just sit down and read for pleasure. I hope there are moments when I have to wonder what to do and that I actually choose to just go outside and sit in the swing. I'm hoping that more often than in the past few months, I'm not thinking of what needs to be done but just being present and enjoying the day. I feel that happening already, and I'm so glad for it. I hope you have a good fall too!